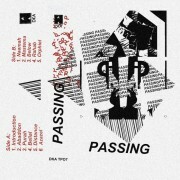 DKA is proud to announce the debut cassette from Passing (AKA Christopher Myrick.) Passing hails from Los Angeles and has been active on the scene for the last couple of years. Myrick was initially a founding member of Bestial Mouths but left the group and started Passing as means of exploring a more minimal sound. After a brief stint as a duo, Myrick decided to make Passing a solo project. For his debut self-titled full length on DKA Myrick has submitted eleven tracks of pulsing EBM that manages to sound like the future-past of EBM and Industrial music.